Alexandra Whittingham is a talented guitarist injecting youthful enthusiasm to the classical music world! We have recently been writing about some of, at least in our view, the very best acoustic guitarists that you may not have heard of. Most of the guitarists that we have covered in the series have been very contemporary in their approach to the acoustic guitar. 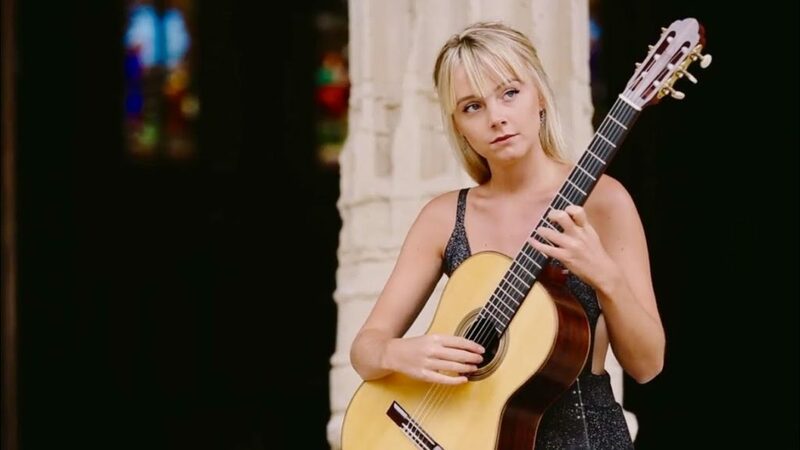 But we saw a video recently of Alexandra Whittingham, which made us realise that classical guitar still has a lot to offer to a modern audience. Alexandra Whittingham is a young guitarist who will, we think, go onto become the fresh face that classical guitar needs to widen its appeal. Whittingham first picked up the guitar when she was just five years old. Her father started to teach her the basics of playing but, as is often the case with a precocious talent, she went onto take private lessons. Although her main passion is classical music Alexandra Whittingham studied piano, jazz guitar and composition at the world renowned Chetam School of Music for 7 years. From Chetam School Alexandra Whittingham went onto the Royal Academy of Music. In the spring of 2013, Alexandra won the inaugural Edinburgh Guitar Competition. Following this, she travelled to Budapest to take part in the Carpathian International Youth Guitar Competition, where she gained second place. More recently in early 2015 at the Gregynog Young Musicians’ Competition, Alexandra became Gregynog Young Guitarist of the year after her performance of Leo Brouwer’s Sonata and Sevilla by Isaac Albeniz. Alexandra Whittingham is one of those guitarists who is able to fuse both technical ability with emotion, a rare skill, and this is, we believe, what sets her apart as a guitarist to watch. We could have selected any number of her amazing videos, all of which can be found on her You Tube channel but we have picked her latest video which is an amazing rendition of Asturias by Isaac Albeniz. Alexandra Whittingham plays a 2011 Christopher Dean guitar, sourced by Miles Roberts at Kent Guitar Classics. To find out more about Alexandra Whittingham you can visit her website.